No one likes hearing about a no-hitter after the fact, and even if you don’t watch the whole game you’d like to at least catch the last couple of innings of something that has occurred only 287 times in baseball history. 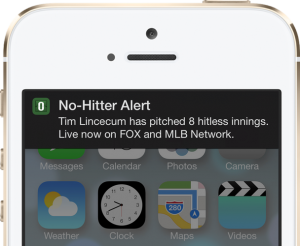 For a mere 99 cents, iPhone and iPad owners can make sure they stay in the came with the No-hitter Alerts app by Ben Packard. 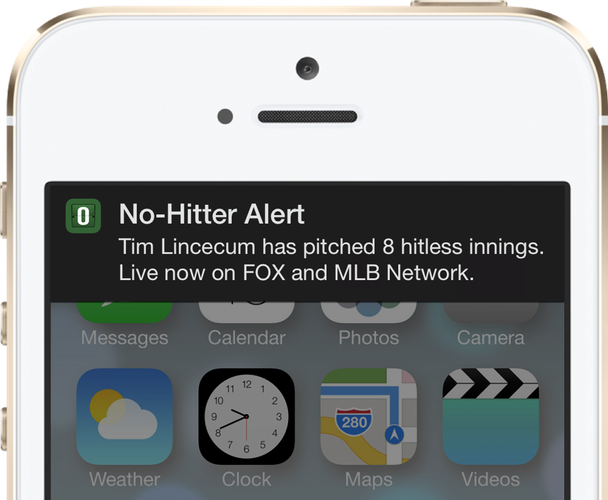 The app will notify you of any no-no in progress in whatever inning you want choose. No-hitter Alerts lets you set a different inning for teams you care about, so if I happen to be missing a Mets or Padres game on a particular night I get a heads up in the fifth, while other teams are set to the seventh. The app’s website is http://nohitteralerts.com/ if you want to learn more. Sorry Android users, it’s Apple products only.